KFZ: Superb bedding for the best night's sleep! Imagine wrapping up in colors! Get a perfect sleep in the most comfortable bedding sets. Recharge your batteries! Wake up more refreshed, relaxed and peaceful than ever! How about a sleep update? Beautifully Magic designed cartoon Animal flower popular printing. What more can you ask to brighten up lazy lie-ins or add extra comfort to your nights? ●Great value, supreme textures and dynamic design ●Fun design and vibrant colors - perfect for teens, kids, modern home décor ●The highest quality fabrics - resistant, silky soft, skin-friendly ●No harmful chemicals to trouble your sweet dreams ●Time-saving - This microfiber sheet set with duvet cover + pillowcases is suitable for machine washing! KFZ Bed Set care instructions: First washing: You may add a spoon of salt into the cold water (less than 30 degrees). Next time: add sheet sets in the washing machine (salt optional). A thoughtful & practical gift choice! Treat your friends and loved ones with the secret of an excellent sleep. The KFZ collection's gorgeous designs and fabrics are a unique gift! Lively, modern, delicate and durable. 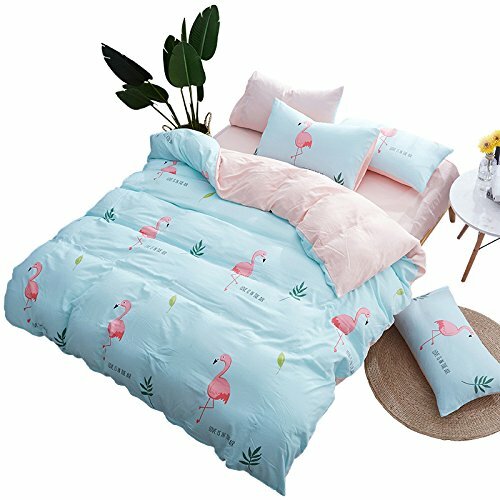 Sweet dreams come in KFZ Twin Full Queen Kiing Sets shapes & sizes: Twin size, suitable for 4.0/4.5 feet bed Duvet cover 155*205cm(60"x 80") 1pc Flat sheet: 160*230cm(63"x 90") 1pc Pillowcase: 45*75cm(17"x 29") *2pcs; Full size: suitable for 4.5/5.0 feet bed Duvet cover 180*220cm(70"x 86") 1pc Flat sheet: 230*230cm(90"x 90") 1pc Pillowcase: 45*75cm(17"x 29") (2pcs); Queen Size: Suitable for 5.0/6.0 Feet bed. Duvet cover 200*230cm(78"x 90") 1pc Flat sheet: 230*230cm(90"x 90") 1pc Pillowcase: 45*75cm (17"x 29")2pc; King Size: Suitable for 6.0-6.5 Feet Bed, Duvet cover 220*240cm(86"x94")1pc Flat Sheet: 230*250cm(90"x98")1pc Pillowcase: 45*75cm(17"x29"). Shipping info ●All orders are shipped within 3 business days after the payment has cleared, usually it takes 12-15 working days to arrival from China by USPS. ✅ KFZ Twin Full Queen King bed set comes with 100% satisfaction guaranteed and prompt customer service within 24h.